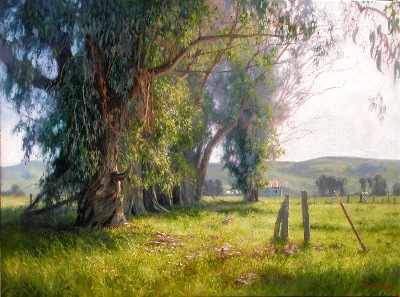 The original paintings of June Carey are painted in oil on linen. The process involves , recreating the scenes that inspire her to express in paint, the essence of "a place I want to be". 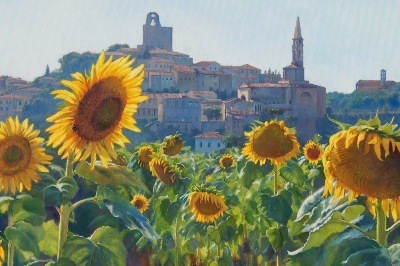 After doing multiple small studies in oil, the finished work is created using a combination of the study and numerous photographs she has taken. "I spend my most inspiring times running after the perfect light with my camera, in California and Italy, climbing fences, trees, being chased by dogs and field workers, and getting lost.I stretch all my own canvases, some very large, and build my own shipping crates. I now have two studios in my home, one upstairs, one down, and hopefully, I can paint twice as fast. People ask what I do for exersize...? Why do I need that?" 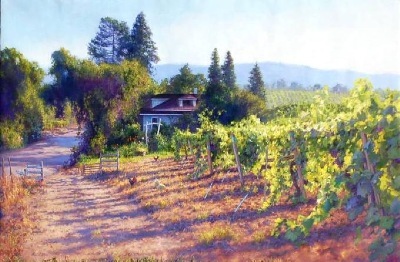 The paintings of June Carey are reproduced in the highest possible quality, low-number, Limited Edition Giclee s by Greenwich Workshop fine art publishing, sold world-wide in 1,200 galleries. 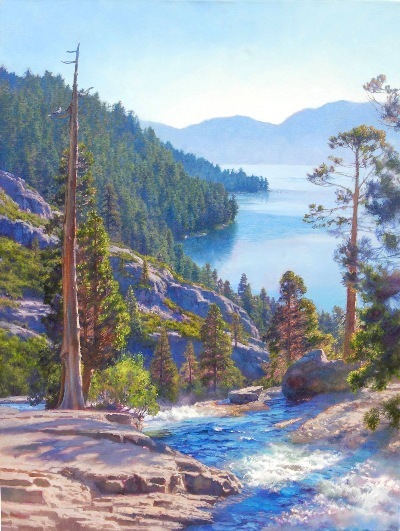 In 2003, after the loss of her artist husband, David Thimgan, June was invited to participate in the the highly prestigious and competitive MASTERS OF THE AMERICAN WEST Invitational show at the AUTRY NATIONAL CENTER in Los Angeles, California. Currently, most of the originals are commissioned works that may never be seen on a gallery or museum wall. That is one important reason for making the work available to be viewed on this website.